made from approx 3mm thick Beechwood. 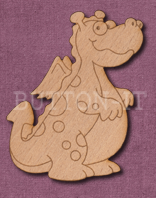 Laser Engraved Cute Dragon Craft Shape made from approx 3mm thick Beechwood. Perfect for Special Projects, easily decorated with felt pens, gel pens, paint etc.